The multifunctional Back-Roller Urban is ideal for all those looking for a spacious waterproof pannier for work, university or school. It is the perfect accessory for the urban casual or business outfit. Thanks to the PU-coating on the inside the Cordura cotton blend in textile looks is 100% waterproof. ORTLIEB‘s innovative rack mounting QL3.1 allows even more comfortable and quicker mounting of the pannier. Simply insert into the lower mounting element, move towards the rack and slide into the top hooks by a lateral motion from left or right. The hooks lock automatically and disengage by lifting the bag. The QL3.1 mounting set features three attachment points and can be mounted to any standard rack. Height and angle are individually adjustable. The mounting components on the bag‘s rear side are flat leaving the bag‘s back uncluttered, ideal for use in daily life. An internal pocket consisting of a main compartment and a zippered mesh pocket keeps things organized. 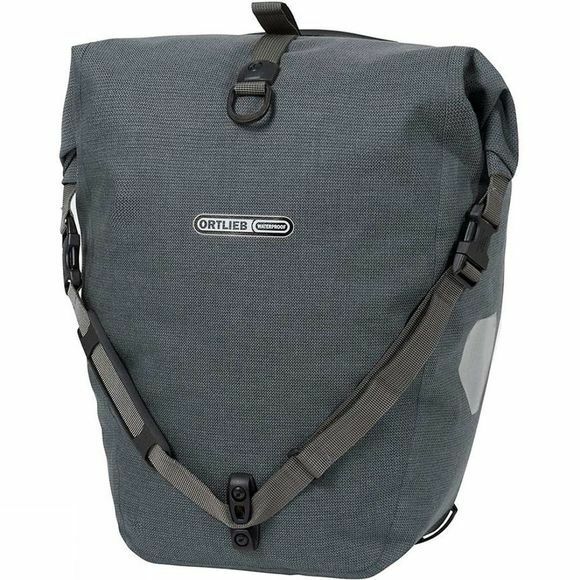 With the included shoulder strap the pannier can be comfortably carried as shoulder bag. Two large strong reflectors make the cyclist highly visible in traffic.